In this week's #AskTDS blog, we answer an agent's question: "How will the deposit cap affect TDS members?" Set to come into force on 1st June 2019 in England, the Tenant Fees Bill 2017-19 to give it it’s official name, will affect how tenants rent, what letting agents can charge, and the level of deposit that can be taken. The deposit cap will limit the amount of deposit that can be taken for a tenancy to 5 weeks’ rent where the annual rent is up to £50,000. For those tenancies where the annual rent exceeds £50,000, the deposit will be capped at six weeks’ rent. It will only affect new tenancies beginning after the changes are introduced, so those already renting may not see any change at first, but everyone in the private rented sector should be aware of what it will mean for them. It won’t affect the day-to-day service you receive from TDS, but we will be issuing guidance to our members. We have a responsibility to ensure that our letting agent, landlord and tenant customers are made aware of what it means for them. Over the coming months we will prepare clear guidance to support our customers and ensure they are aware of their rights and responsibilities in terms of tenancy deposits, deductions and disputes. Our partner organisations, the Residential Landlords Association (RLA), ARLA Propertymark, and RICS are publishing guidance for their members too. Further information on the progress of the bill and what it entails can be found on the UK government website. 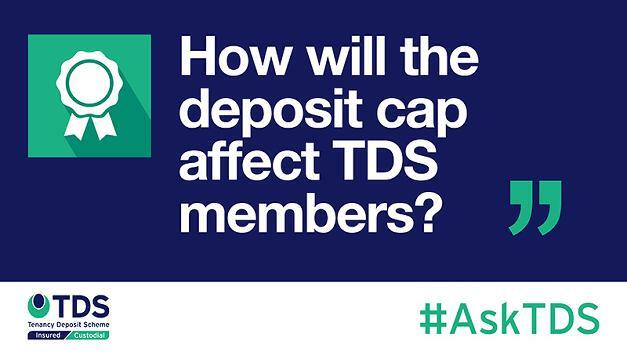 For more information on how the deposit cap might affect deposits, you can contact the TDS team.